BP 146/88, SaO2 99% (RA), chest clear. Regular without obvious P waves. Broad complex tachycardia with RBBB appearance and features of AV dissociation, highly concerning for ventricular tachycardia. DDx: Atrial flutter (2:1) + RBBB. What would you do next ? Meanwhile, the patient stays connected to a monitor with defibrillator pads placed for good measure. He is advised to stay nil by mouth, pending the need for sedation. You also arrange for his AICD to be interrogated. 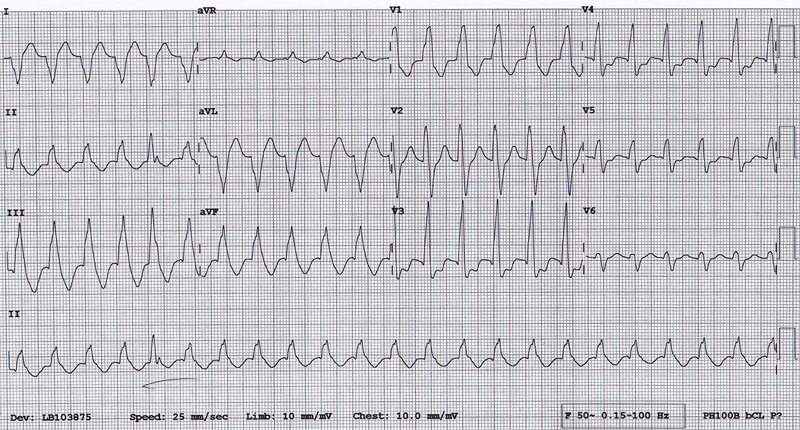 We top up his magnesium and obtain this second ECG…. Broad complex tachycardia at a rate of 136 per minute. RAD. 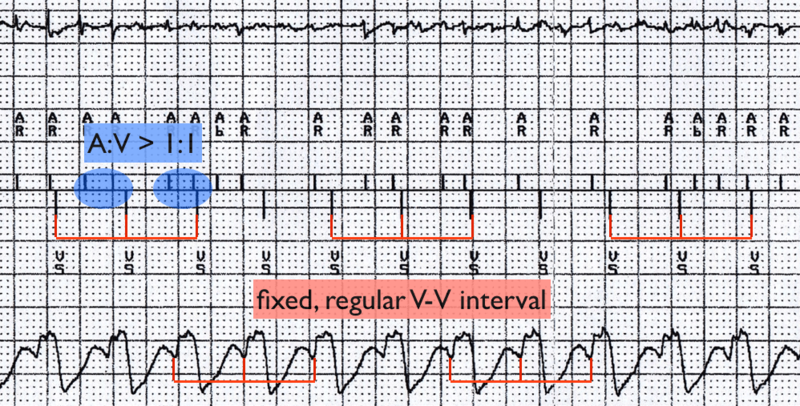 Underlined complex (#5) concerning for AV dissociation. So you finally get his AICD interrogated…. A-lead demonstrating fibrillation at a rate of 175-375 bpm. V-lead sensing independent ventricular tachycardia at a rate of 136/min. There is no association between the atrial & ventricular rhythms. ie. ventricular tachycardia with co-existing atrial fibrillation !! Double tachycardia is a relatively uncommon type of tachycardia. It is classically defined as the simultaneous occurrence of organised atrial and ventricular tachycardias, or junctional and ventricular tachycardias. They can be difficult to diagnose and often require electrophysiology studies for further assessment. Interestingly, the presence of dual-lead ICDs now allow for this non-invasively. Atrial fibrillation is a very common dysrhythmia in patients requiring an AICD. >50% of patients develop AF during the lifespan of their device. In the setting of an AICD, AF can result in inappropriate ventricular shocks, ventricular arrhythmia induction & thromboembolism (after ventricular shocks in the presence of unknown AF). Dual chamber rate-responsive pacing may prevent AF by improving haemodynamics, optimising ventricular filling and preventing retrograde atrial conduction. New overdrive pacing algorithms have been introduced to add incremental anti-arrhythmic benefits to physiological pacing. The aim is that consistent atrial pacing acts to suppress atrial fibrillation. The PR Logic dual-chamber detection algorithm is widely used in dual-chamber Medtronic ICDs. 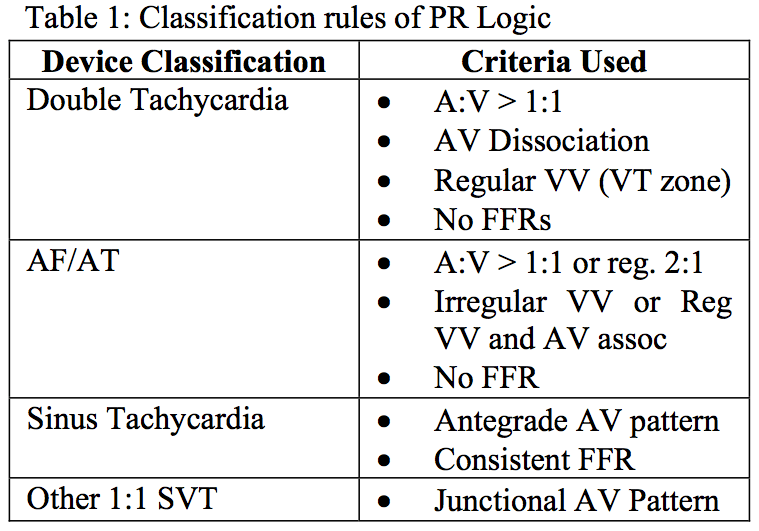 It discriminates SVTs from ventricular tachycardias using hierarchal rules & timing of atrial and ventricular events. Now, lets go back & have a closer look at that interrogation strip…. Unfortunately this was unsuccessful so an amiodarone bolus was administered and an infusion commenced. Approximately 45 minutes into his infusion, our patient dropped his blood pressure into the 70’s with associated clamminess and distress. He received some ketamine sedation and was cardioverted to sinus rhythm. He was discharged home two days later. Washizuka, T., Niwano, S., Tsuchida, K., & Aizawa, Y. (1999). AV reentrant and idiopathic ventricular double tachycardias: complicated interactions between two tachycardias. Heart, 81(3), 318–320. Santini, M., & Ricci, R. (2001). Atrial fibrillation coexisting with ventricular tachycardia: a challenge for dual chamber defibrillators. Heart, 86(3), 253–254. Chowdhry, I. H., Hariman, R. J., Gomes, J. A., & El-Sherif, N. (1983). Transient digitoxic double tachycardia. Chest, 83(4), 686–687. Brown, M. L., Christensen, J. L., & Gillberg, J. M. (2002). Improved discrimination of VT from SVT in dual-chamber ICDs by combined analysis of dual-chamber intervals and ventricular electrogram morphology, 117–120. 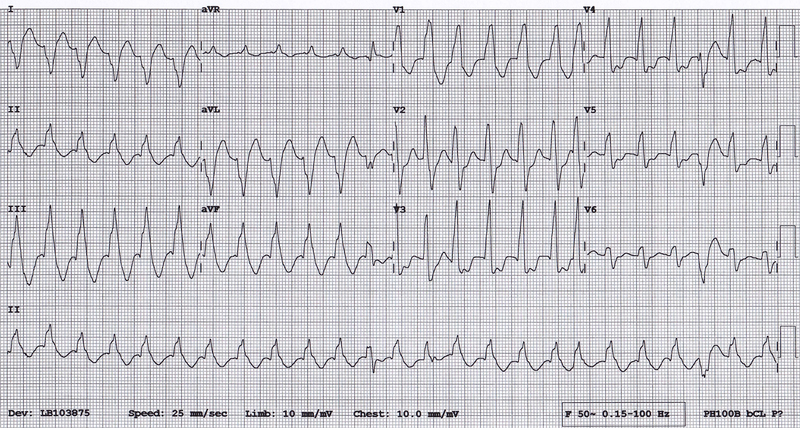 Jason’s Blog: ECG Challenge of the Week for Feb. 24th – March 3rd – another example of a double tachycardia case ! !